Prototype: French State Railways (SNCF) class 115000. With a single-arm pantograph. "en voyage" paint scheme and design. Road number 115053 with the coat-of-arms for "Trouville Sur Mer". The locomotive looks as it currently looks. 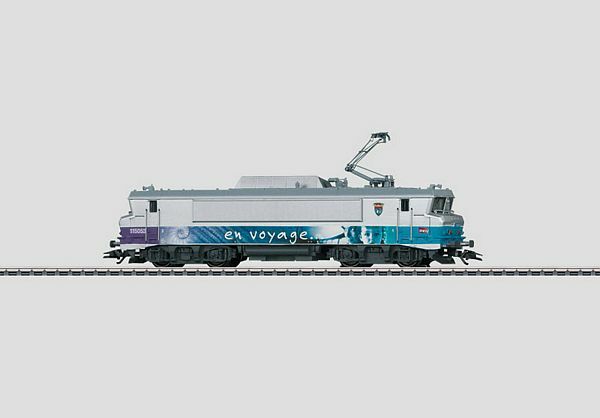 Model: The locomotive has an mfx digital decoder and a controllable horn sound. It has controlled high efficiency propulsion. 2 axles powered. Traction tires. The dual headlights and dual red marker lights change over with the direction of travel, will work in conventional operation, and can be controlled digitally. The headlights at Locomotive End 2 and 1 can each be turned off digitally. The headlights and marker lights are maintenance-free, warm white and red LEDs. Length over the buffers 21.0 cm / 8-1/4".